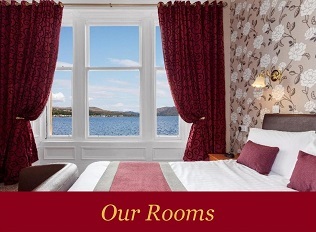 Situated on the quiet Craigmore shore in Rothesay on the Isle of Bute, Scotland, The Bayview Hotel Rothesay is a Visit Scotland Four Star Rated Guest House which provides bed and breakfast accommodation in Rothesay. 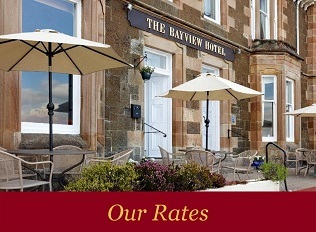 Conveniently located only a 15 minute walk from Rothesay Town Centre and Ferry Terminal, The Bayview is the perfect place to stay for those simply wishing to relax, or for those who want to explore the beautiful Isle of Bute. 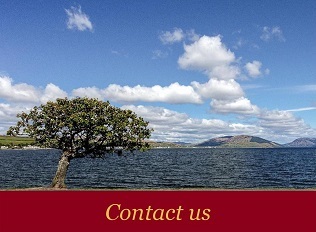 With breathtaking, panoramic views over Rothesay Bay and looking up towards Loch Striven and the magnificent Kyles of Bute, this Victorian guest house is regarded as one of the finest seafront guest houses in Rothesay. The Bayview is run by proprietors Andrew and Irene McGregor who have been welcoming guests from all over the world since they purchased the guest house in 1995. Every guest who arrives at the Bayview is greeted with a warm and friendly Scottish welcome and is made to feel at home from the moment they arrive until the moment they depart. To ensure your stay is as comfortable, relaxing and enjoyable as possible Andrew and Irene are always available to cater for your requirements. Built in 1896, The Bayview Hotel Rothesay has been lovingly and tastefully restored and upgraded over the past 20 years and successfully combines Victorian grandeur with modern luxury. We have ten well appointed, bright and spacious bedrooms which are all finished to the high standards you would expect in four star guest house bed and breakfast accommodation in Rothesay. The Bayview also has a resident's licence, a lounge, dining room, sun terrace, free private parking and Wi-Fi. We look forward to welcoming old friends back again and meeting new friends who have yet to discover us. The Bayview does not take pets and is no smoking throughout. To ensure the guest house is maintained to the highest of standards The Bayview closes over the winter months. We are now taking bookings for the 2019 season. To make a booking click here.